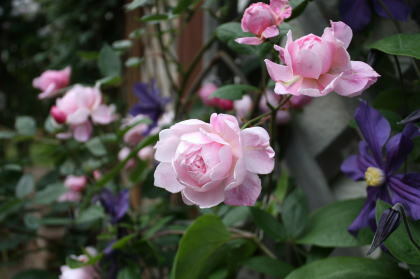 Gunsei can be used as a climbing rose in cold cool areas. Ballerina can't grow tall here because of the coldness. 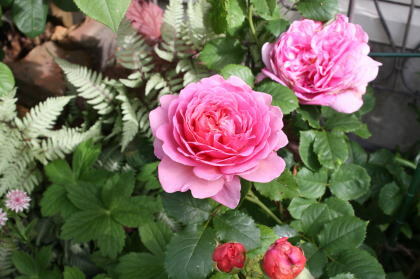 Under the kitchen window, Princess Alexandra of Kent is blooming in magen pink. 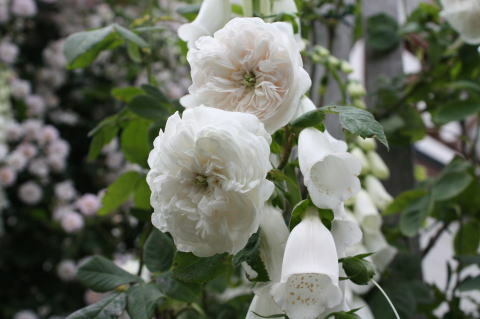 The flowers are really elegant and graceful like a princess. 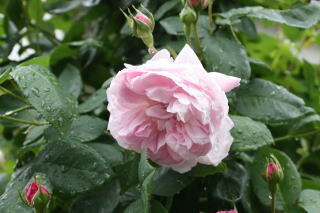 Together with a climbing rose:Constance Spry. 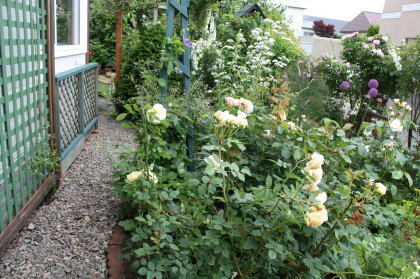 One day in the neighbourhood my husband found the sets of discarded trellis. When he showed them to me, I couldn' t believe they would be recycled. But my husband's policy is you can recycle almost all discarded lumber! And look! It's true. 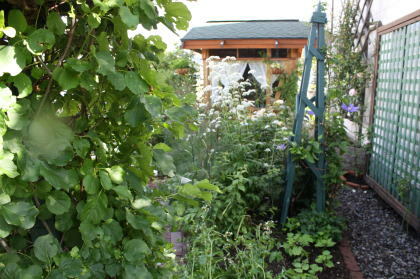 The trellis painted in grayish green was mounted on the west wall of our house. The old obelisk was painted in grayish green. 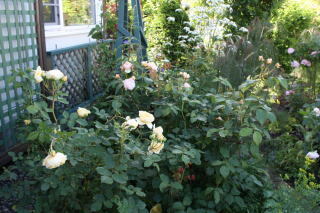 Our west garden looks nice with yellow roses! 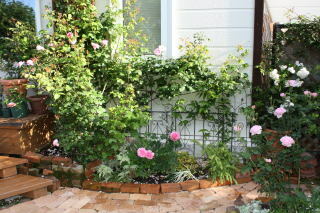 I will plant new roses and flowers beside the trellis from now on. Looking forward to seeing them climbing! Front:Blue berry bush in our kitchen garden. As for Ilex macropoda Miq., there are a female tree and a male tree. 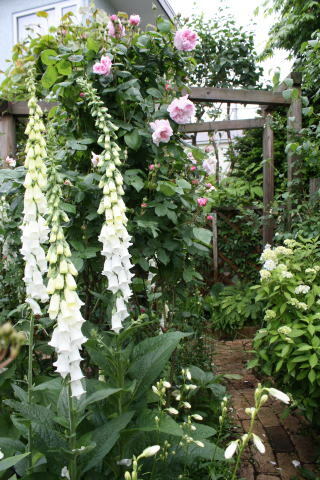 The nurseryperson said that he could not identify because it was a young tree. "Don't worry. 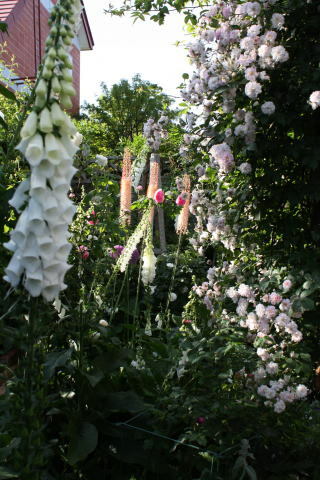 If it is a male tree, the tree shape will be straight and beautiful. If it is a female tree, it will bear pretty red fruit. So it's O.K.!" 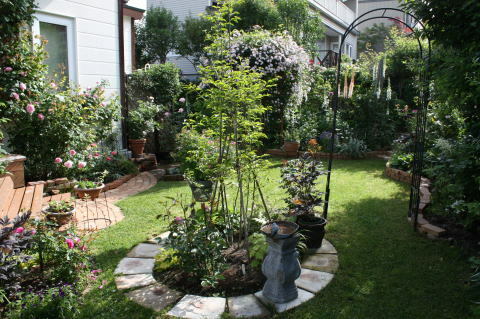 Though it cost us 18,000 yen (the most expensive tree in our garden! ), we didn't know why but we bought! Another problem is more serious. In my Illustrated book of Trees and Shrubs of Hokkaido, they say Ilex macropoda Miq. grows naturally in the southern part of Ishikari, Hokkaido. My town Kitahiroshima is in the northern part of Ishikari! I hope Ilex macropoda Miq. will survive this winter! 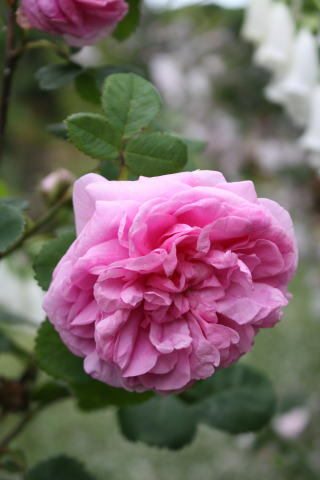 The most beautiful rose of the year was Fantin Latour. 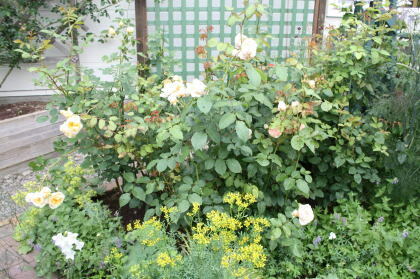 Though I have been growing it for several years, its shoots withered because of the frost damage every year. 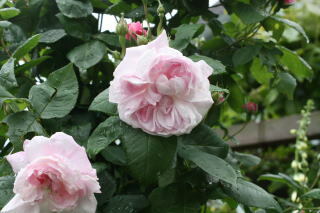 However, it was vigorous and healthy this year. It had so many buds and flowers. 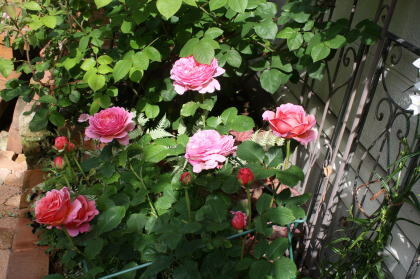 People asked me the name of it for the first time, though it had bloomed behind other roses every year. 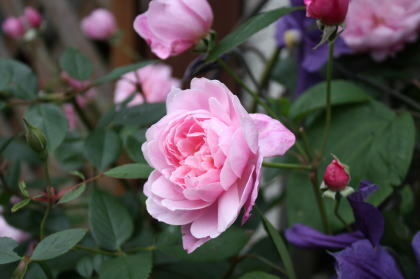 The flower is bluish soft pink, very fragrant. 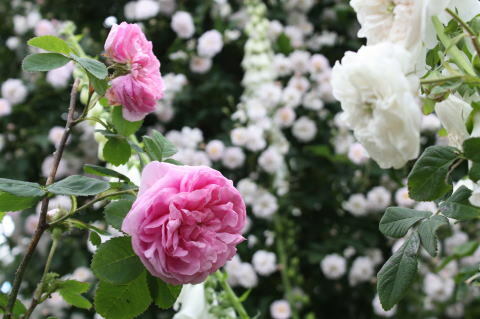 One of the most popular old roses in the world. 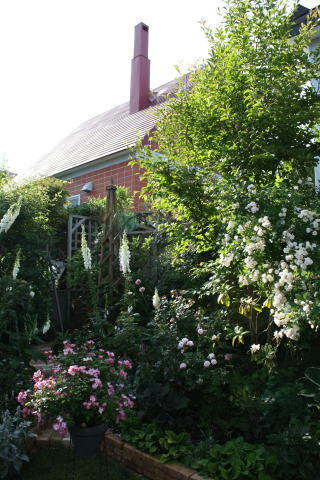 My husband former work, garden shed. 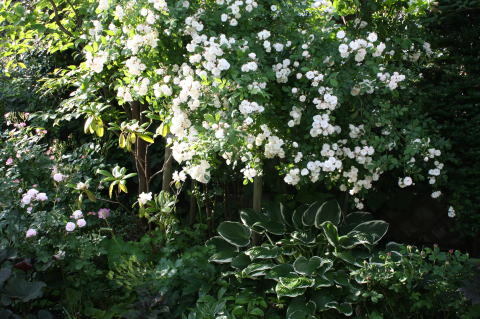 Blush Noisette is usually used as a climbing rose, however, the height is always 60 cm in my garden. 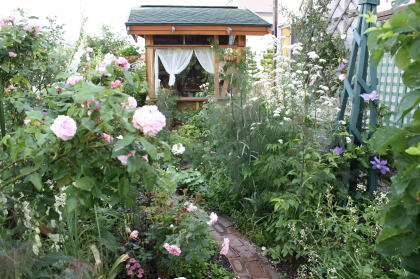 The east garden is in full bloom! 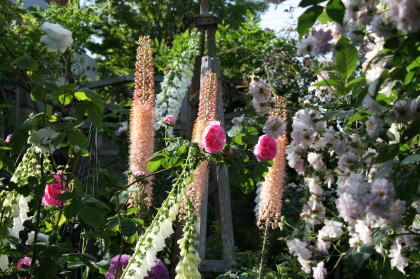 The erect flowers are so straight. They attract attention in my garden. 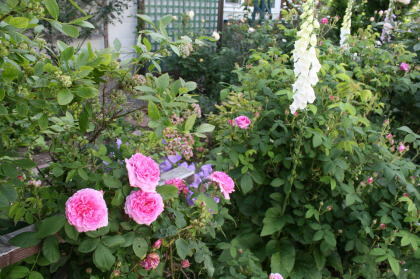 Both left tall trellis and short trellis are the discarded trellis. 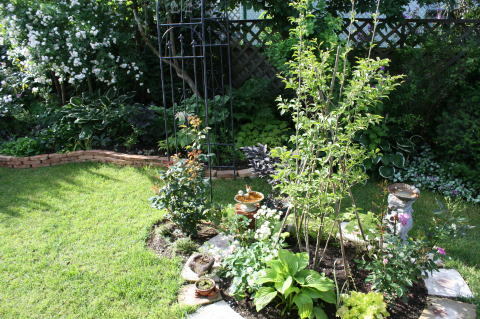 What shall I plant under the trellis? 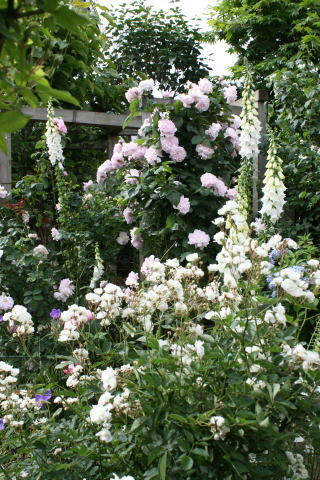 I'm selecting the roses now! Sometimes it doesn't have flowers. 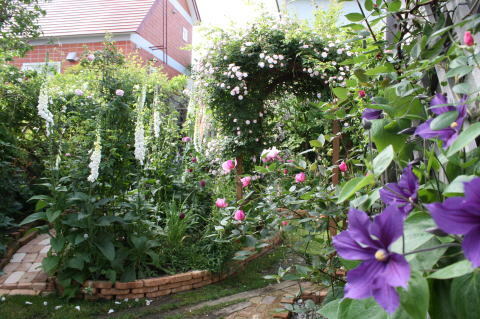 In spring when I can find the flower buds, I'm so happy. 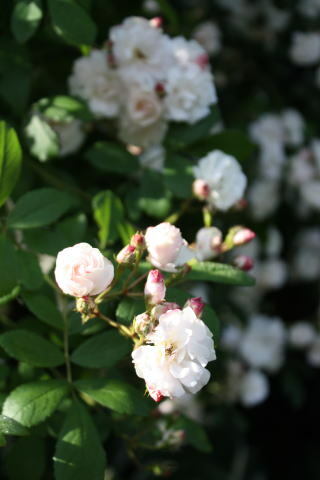 Rosa 'Gunsei' has the white buds blushing on the edge. 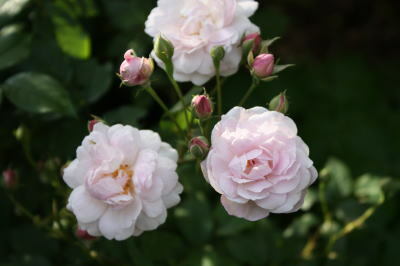 Gunsei is a Japanese rose meaning 'myriads of stars' in Japanese. It looks actually myriads of stars in full bloom in the evening. 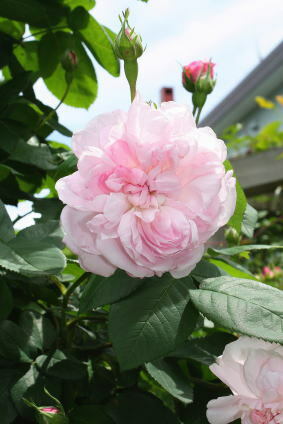 It is vigorous and strong against frost. Old roses: Mme Hardy and Chapeau de Napoleon are two of the first old roses planted in my garden. Still they are beautiful and healthy. 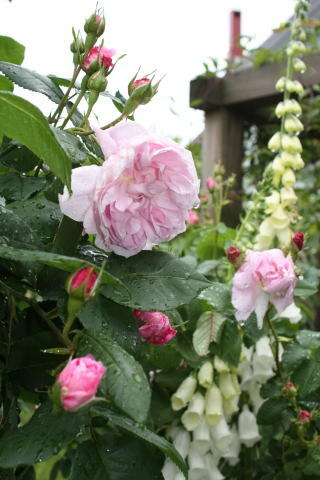 I love their romantic old rose color and frangrance! 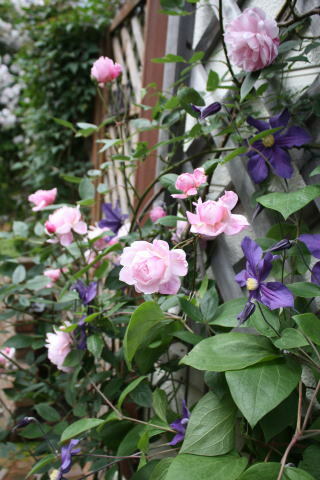 In early July when Paul' s Himarayan Musk on the east arch begins to bloom, Clematis integrifolia x durandii and ER Mortimer Sackler are most beautiful in deep purple and deep pink colors with each other. 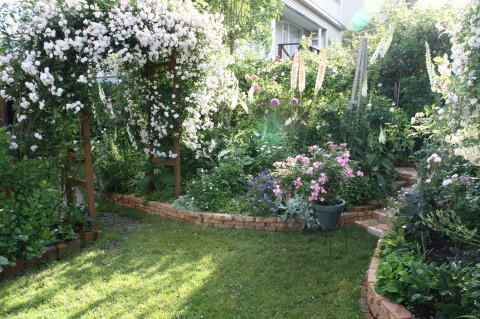 Please look at our new garden spots! 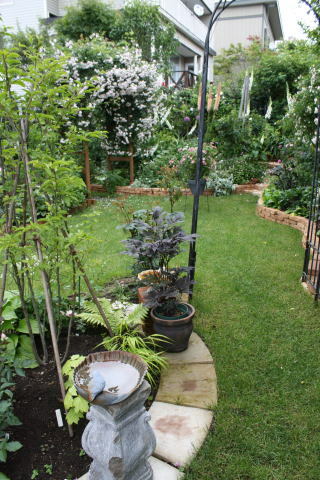 The circle stone area appeared in the center of our garden, where our symbol maple tree had suddenly withered the year before. We were shocked at first and then changed our minds to make a new plan. 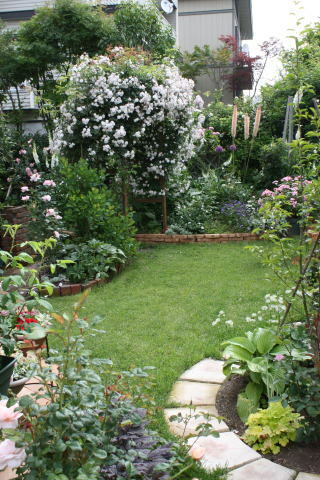 Our west garden changed a little, too. My husband found the sets of discarded trellis in the neighborhood. He recycled them painting in grayish green and put them on the west side of our house. How wonderful! 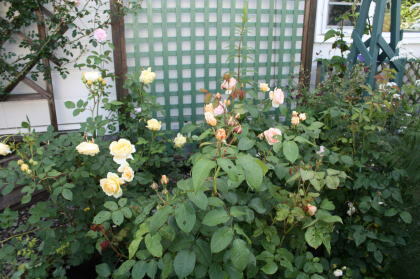 Which roses and flowers shall I plant here? 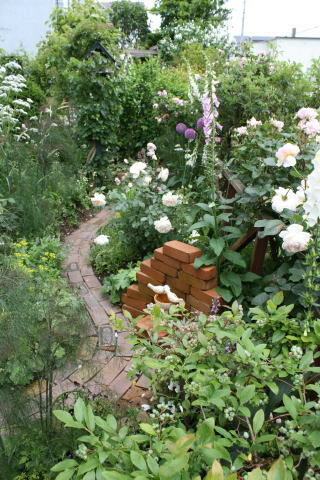 I'm looking forward to seeing them grow on the trellis! It took my husband and me whole six months to dig the withered maple roots. I arranged the circle stones before winter and in spring we planted our new symbol tree: Ilex macropoda Miq. They say it is a recent popular garden tree, however, we found some problems after we planted it.